2017 marked the 25th anniversary of AFTS, and they celebrated the occasion by hosting a fund-raising gala. On May 4th, AFTS had a wonderful evening of food and drink which included an auction and silent auction raising several thousand dollars for AFTS. I was fortunate enough to share in the evening and was honored, along with some very worthy individuals, with a shadowbox frame containing a heart made by hand from the drop cloths found in the art classes. The University of Texas School of Social Work hosts a screening of Art From the Streets and a Q&A with Layton. 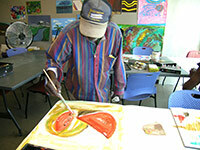 Art From the Streets was featured in the Austin Chronicle in a review by Josh Rosenblatt. Art From the Streets was screened at the Texas Art Education Association annual convention on November 12, 2010. The TAEA 2010 Fall Conference took place at the Austin Convention Center in Austin, TX. The TAEA Conference is the largest and most heavily attended art education conference in the country. Art From the Streets won Best Concept and Honorable Mention Best Documentary at the Los Angeles Reel Film Festival. On August 2, 2009, Art From the Streets won the Jury Award for Best Film at the Lights.Camera.Help Film Festival This festival is specifically for "cause driven" films. For winning this award, all of the proceeds from the festival will go to the subject of the film, the outstanding art program for the homeless, Art From the Streets. Click here to see the interview with Layton during the festival. Art From the Streets was screened at the American Art Therapy Association's annual convention in Cleveland November 19-23, 2008. 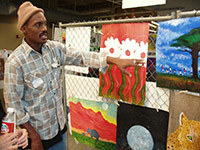 Layton presented Art From the Streets and participate in a continuing education conference at the University of Oklahoma called "Bringing Home the Arts to the Homeless- Programs That Work". The conference will be conducted by the Department of Human Relations and School of Art on November 19, 2007. Layton interviewed with in Retro Life Magazine. 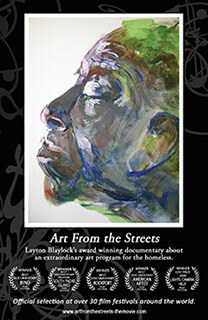 Layton Blaylock's documentary Art From the Streets was featured in the October 2005 Austin Advertising Federation's newsletter in an article written by Maya Sommerlatte. 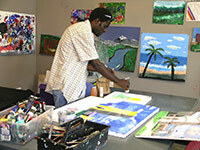 Art From the Streets was featured on the Emmy award winning TV show Downtown. For the show, Producer/Director Layton Blaylock, was interviewed and excerpts from the film were shown as part of a story about the program Art From the Streets. The KLRU show features stories about people, places, and events associated with downtown Austin. Director Layton Blaylock and Art From the Streets were also featured in Screen Magazine on June 23, 2006, in an article by Rob Buikema.